Hookah pipes have been a part of Eastern culture for hundreds of years and are used in various social and religious gatherings. The High-Life Aura Hookah Pipe is great for those who want to experience the delights of hookah smoking for the first time without spending a fortune. This compact hookah pipe contains everything you need to get started in hookah smoking and contains a stainless steel stem, colourful hose, cleaning kit, metal tongs and full user guide so you can get the best out of your pipe. Available now for just £22.99, the High-Life Aura Hookah Pipe is the perfect addition to any avid smoker’s arsenal. 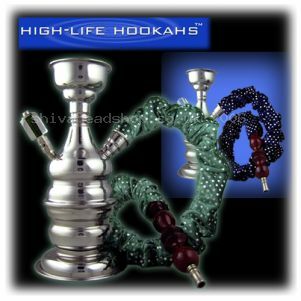 Shiva Head Shop also stocks a wide range of hookah pipe smoking mixtures in a variety of tasty flavours. 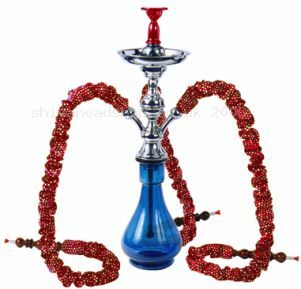 The Venus pipe is the latest High-Life hookah pipe in the range and boasts a two-tone colour scheme with its blue glass chamber and red smoking hoses. This fantastically designed hookah pipe has three smoking hoses making it a great pipe for parties and social gatherings. Standing 53cms tall, the High-Life Hookah Venus is a great focal point in any room and features stainless steel stems, a hand blown glass camber, a traditional clay bowl and a cleaning kit to keep it looking and feeling great. The Venus High-Life Hookah Pipe is available now for just £57.99; why not check out Shiva Head Shop’s range of tobacco free fruit mixtures to add to your hookah pipe. The High-Life Venus hookah pipe is a great smoking accessory to own and is ideal for parties, making a focal point for any room. The blue glass base, chrome stem and red hoses add to the stylish look of this traditional smoking pipe. The High-Life Venus Hookah pipe features 3 pipes, allowing more than one person to enjoy the fun. A range of hookah smoking mixtures is available from Shiva in a range of different flavours, or alternatively you can use your favourite herbal blends instead. Together with the hookah pipe itself, you will also receive a cleaning kit, metal tongs and an instructional guide to get you started.